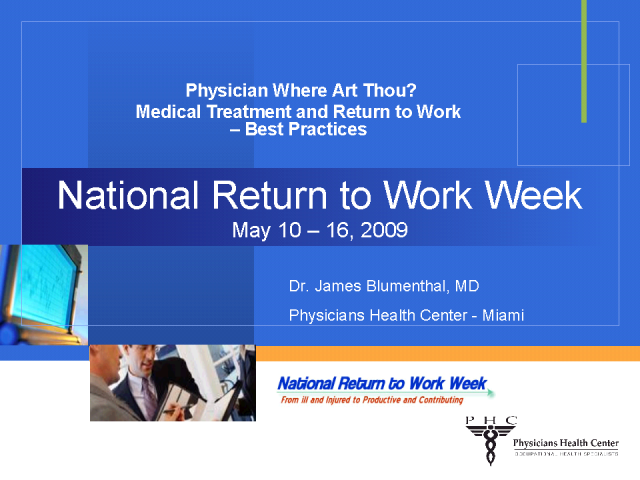 Can you get injured employees back to work without the treating physician? What happens when you do not have a good relationship with the treating doctor? We will interview Dr. Blumenthal and get best practices techniques from him. 10 ways to work effectively with treating physicians and foster a positive relationship. An introduction into how to leverage behavioral science and AI technologies, such as Machine Learning & Natural Language Processing, to attract and engage top talent. The discussion focuses on the scientific methodology underscoring the Net Culture Score℠ and Employee Net Culture Score℠ assessments. Use cases demonstrate the advantages of using evidence-based applications to measure, re-engineer, and monitor your corporate culture, providing a look at the future of HR analytics. Megatrends are the global, social and economic issues that are touching all of our businesses. CEO's are focused on how these trends in the world will impact long term success of the organization - and your employee population is at the top of the list. But how do we know what will impact our organization in 10 years? Business futurists are consulted to predict where trends are going and what savvy organizations need to do to complete. HR departments have to get ahead of the megatrends that are facing their businesses and anticipate trends that will impact employees. Explore the top megatrends CEO's are watching for the next 10 years, and determine how you can implement these to focus your human resources initiatives. Don't miss this opportunity to get ahead of the curve and bring the latest thought leadership back to your organization. Lori Kleiman is an accomplished businessperson, entrepreneur, and leader. In her most recent corporate role, Ms. Kleiman orchestrated a group of 18 HR consultants nationally. She brought cutting edge HR techniques to the group and fostered a practical sense of HR to small businesses. She built an HR consulting practice that included six consultants supporting business of all sizes. She then sold that business to Arthur J Gallagher. Lori has conducted seminars to business people and HR professionals sharing best practices and new initiatives to bring to small businesses throughout the United States. With a Master of Human Resources and the highest level of certification available in HR, a SPHR and SHRM-SCP designations, and as a member of the National Speakers Association, Lori has the depth of knowledge needed to provide her clients with the foundation of traditional study and real-world solutions to drive immediate action. In this tight labor market, it's more important than ever to have a strategy for an employee to jump to another company. Companies need to be proactive and have a proper succession plan in place before it's too late. Data is not magic – it’s a set of facts that support decisions to help solve today’s most pressing people issues and strategies. Organizations who collect and understand people data better understand how employees think, learn and behave. Data is vital for decisions in hiring, onboarding, solving performance problems, developing high potential employees, training and any element of human capital management. Supplementing current knowledge and experience is an agile way to answer vital people questions. •Learn 6 key personality dimensions and how they influence job performance and fit. •Apply data to perform your key role of workforce and people management expert. •Gather people metrics and utilize it for hiring/onboarding, team engineering, culture and training. For over 20 years, Jennifer Leake has been an Employee Engagement Champion committed to helping others hire the right people; provide them with clear expectations; and develop leaders who know how to manage and motivate individuals for personal and business success. She is a Certified Emotional Intelligence Practitioner, a Certified Management Consultant (CMC®) and an employee assessment authority, certified in a variety of business assessments used for hiring, developing and retaining key talent. –What is people analytics and what are the benefits that can be derived from it? –When doing retention analysis, how to move from conducting in-depth but reactive exit interviews to analytics techniques that are predictive and more objective and quantitative? –What McKinsey’s studies on retention reveal: Which factors are better predictors of unwanted attrition than the commonly intuitive things like individual’s performance rating or compensation? –How can the service experience of employees be improved when interacting with HR? –How can routine HR tasks be automated and work flow effortlessly in your HR department? This presentation will demonstrate how to avoid common startup hiring mistakes within organizational talent and recruiting strategies. Jerry will focus on how AI is facilitating #HRTech in talent acquisition and participants will learn what the key recruitment models that can be utilized. Pepsi, MTV, Hennessy, Bic, Toyota… these are just a few of the major companies Jerry has worked with; even to the extent of building and leading teams for their digital projects. For well over 10 years, he has excelled in the unique cross-section of marketing, design, and human resources all wrapped in technology. After moving on from these high-scale opportunities, Jerry went on to cofound Let’s Order Now, a food ordering service with a strong social direction. It was here where he further made use of his wide range of skills to get the startup off the ground and scaling. However, he was not able to truly build the perfect team, and so had to witness its end. After realizing once again the importance of a great team, Jerry and his wife founded EmployToy, with the purpose of helping others find great talent and build great teams. We provide an introduction into how to leverage behavioural science to better understand not only the corporation’s stated values but also the lived values of employees. By assessing institutional and individuals values, we can ascribe a numeric “score” that measures the cultural alignment (and misalignment) within the workplace. As a result, HR professionals gain a tool for unbiased, values-based recruiting, as well as the data intelligence they need to retain a culturally-rich workforce. Erin Michelson is Founder & CEO of Summery (www.summery.ai), a data analytics company that leverages behavioural science to quantify institutional culture and individual social impact values. Recognized as a pioneer in the #PhilTech space, Erin has been profiled in @Entrepreneur, @BBCTech, @HuffPost, @NatGeoTravel, @FoxNews, and @NPR. Unemployment is at a record low, which is great for the economy, but tough on recruiters, now that hiring has become a seller’s market. But new AI-powered solutions for virtually every part of your recruitment funnel can give you the advantage you need in a tight market, and even improve your bottom line: Companies leveraging AI in their hiring initiatives are seeing an increase of 18 percent in their revenue and a 30 percent boost in profit. And with over 62 percent of companies expected to be using AI to find and hire the best talent by the end of this year, getting on board the AI train has become an imperative — if you want to stay competitive. Join execs from Adecco, LinkedIn, and Trivago to learn how how AI is revolutionizing their ability to resource high-quality talent, and how your company can do the same, in this VB Live event! * Whether your recruitment and retention efforts are "AI-ready"
Companies today are challenged with managing a five generation, multinational workforce. Uniting this workforce to high levels of collaboration where individual insights and expertise are embraced and valued is a competitive advantage yet to be realized. Using a behavioral science approach, we provide the tools to help you measure and assess individual social impact values and how these values align with your company culture. As a result, you’ll be able to attract a more diverse, high-performing pool of candidates. Every new employee is asked "How was your first day?" when they arrive home after starting a new job. How do your new employees answer that question? Critical for employee success and retention, an effective on-boarding process for new hires gives them a great first impression of your company and sets the stage for their performance in the days ahead. Jennifer Leake CMC, Founder of Assessment Pros LLC has helped clients for over 20 years in their quest to avoid the costs of a wrong hire. It's vital to hire the right people because you can't train your way out of it when it happens, and the best product, processes or sales tools won't produce results if you don't have the right people in the job to begin with. Her 3-part "People System" creates high performing Employee Engagement with the right hires, on-going coaching and feedback and bosses people want to work for. When Alice in Wonderland asked the Cheshire cat "Which way should I go from here? ", he replied, "If you don't know where you're going, any road will get you there." The same holds true in hiring. When you fail to consider key factors in what you are looking for in an employee, the likelihood of hiring the wrong person increases substantially. Suzanne Paling, Founder of Sales Management Services, provides sales management consulting and coaching to company presidents, owners, entrepreneurs and business executives seeking to increase revenue by improving their sales organization’s performance. She has helped more than 55 companies hire qualified, motivated sales people and sales leaders and create an on-boarding process to help those new employees succeed. Suzanne is the author of two award-winning books “The Sales Leader’s Problem Solver” and “The Accidental Sales Manager”. ​In July we will be celebrating 3 years of writing Boolean Strings together, every day, for pay. It’s crazy to think of how far we’ve come in such a short time. To begin, we talk about this data, every day, too. It’s a scale of sourcing that we, frankly, haven’t had the pleasure to do back when we were “internal corporate guys” in recruiting or TA. The UX for Recruitment Method trains recruiters to think like UX Researchers, positioning candidates as the end user of the recruiting process. Originally designed to help non-technical recruiters to better recruit in the tech industry, these tools can be used across all industries. These key UX tools speed up comprehension of new tech roles while improving engagement rates with passive talent and technical hiring managers. In this hyper-focused session, Alison Daley of Recruiting Innovation will introduce you to the UX tools of Talent Personas, Journey Maps and Contextual Interviews. We will walk through a case study of how to apply these tools to your recruiting process. You will leave this session ready to hit the ground running with a new approach to your recruiting process, ensuring increased placements and confidence in your work. Big data has become one of the guiding realities for businesses in today’s economy. As with many of its fellow departments, HR is now starting to realize the value and use Big Data to more accurately predict the health and productivity of the workforce. In this webinar Tom McKeown, CEO and Co-Founder of TrenData will help define Big Data, in both structured and unstructured form, as well as providing methodologies to access and use Big Data to the business benefit of the organization. This will all be discussed in a framework of how to implement an overall people analytics strategy. Tom McKeown is the CEO and Co-founder of TrenData. He is a senior executive with over twenty-five years of experience in bringing innovative software to market. Tom’s passion is to provide easy to use solutions that both visualize and guide organizations to their best possible future. During his career, Tom has propelled growth in several early and middle stage start-up companies resulting in acquisitions that provided multi-million dollar returns for investors. In the past 10 years Tom has lead two Dallas based human resources software companies, HRsmart and Aquire Solutions, to triple digit growth and successful acquisitions by larger industry players. Prior to that Tom held senior level executive positions at Citrix Systems, Quantum Corporation, and Adobe Systems. We provide an introduction into how to leverage behavioural science to better understand not only the corporation’s stated values but also the lived values of employees. By assessing institutional and individuals values, we can ascribe a numeric “score” that measures the cultural alignment (and misalignment) within the workplace. As a result, HR professionals gain the intelligence they need to recruit, retain and engineer a highly-engaged, top-performing workforce. Erin Michelson is Founder & CEO of Summery (www.summery.ai), a data analytics company that leverages behavioural science to quantify institutional culture and individual social impact values. Recognized as a pioneer in the #PhilTech space, Erin has been profiled in @Entrepreneur, @BBCTech, @HuffPost, @NatGeoTravel, @NPR, @FoxNews. Last year, the World Economic Forum’s Global Gender Gap Report, best known for the annual Davos gatherings, added 47 years to the time necessary to reach workplace equality. According to the WEF, in 2017, gender parity ‘shifted into reverse” and it will take 217 YEARS for disparities in the pay and employment opportunities of men and women to end. It is the first time since 2006 that “slow but steady progress” toward parity has halted. Everyone would agree that annual performance management tools and processes are broken and many are looking towards continuous performance management, but most of the time this does not address the real criteria of performance. We will explain the equation of performance, detail the main criteria and show how to fix employee performance management and boost engagement at the same time. When attracting and recruiting top talent, what does your organisation focus on? Pay? Financial and health benefits such as health insurance and pension or is it something else? Advertising what else your organisation does to promote employee experience and happiness will undoubtedly make you stand out. Attracting and retaining top talents needs an approach that is round and includes more than just pay and benefits. This webinar will look at some of the latest trends around happiness and growth mindset in organisation and why these are the secrets to creating a talent pool of top people in your organisation. This BrightTALK Channel features useful content for human resources professionals. Presentations will cover employment and labor law, emerging media trends, training, onboarding, and employee engagement.